ascended the old slate quarry tramway, seen here between Brandreth and Fleetwith Pike. The fell in the distance is Pillar. 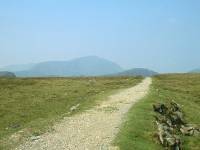 The route to Gable leaves the tramway at its highest point and strikes off left to climb the western shoulder of Brandreth, ahead. 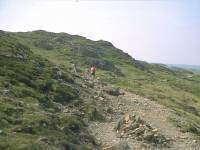 The group ascends the path across the shoulder of Brandreth. 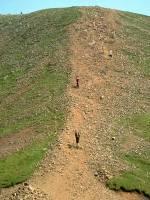 The summit lies a few hundred yards to the left and is only 200ft higher, yet the path misses it completely. 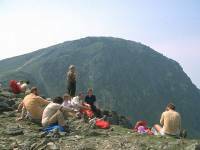 Our group, led by Tim, stops for lunch on the summit of Green Gable (2603ft, Lakeland's 37th highest fell). The dome in the background is Great Gable. 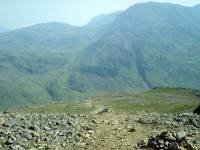 This is the shallow col between Green Gable and Great Gable. Here we're looking back at Green Gable. We're looking down Aaron Slack, the valley descending from Windy Gap to the east, which leads to Sty Head - the walkers' pass between Wasdale and Borrowdale. 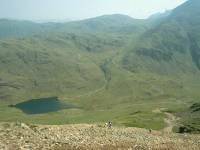 Sty Head tarn, a popular wild campsite, is seen in the hollow. 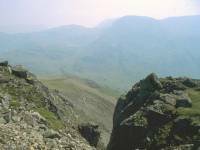 The Scafell group lies beyond. 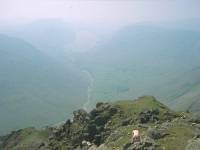 We reached the summit at around 2pm to find haze obscuring the view of Wastwater to the southwest. Somewhere down there are the Napes, a series of crags strictly for climbers only. 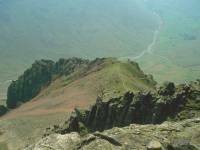 Upper Wasdale is seen below. 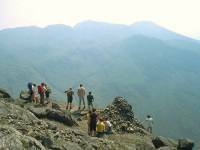 The Mountain Goat group study the view of Scafell Pike from Westmoreland Cairn, just below the summit of Gable. The cairn is one of Lakeland's most famous viewpoints. The Breast Route is the path down Gable's southeast ridge towards the Sty Head col. 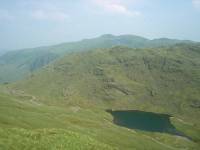 The Sprinkling Tarn path is seen in the distance, with Great End to the right. 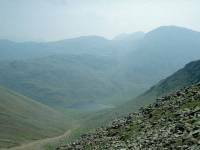 Sty Head Tarn is seen below, while beyond it is the path up to Sprinkling Tarn and Esk Hause. Allen Crags dominates the skyline. 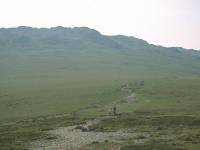 We're descending the Breast Route - a loose, stony path along which progress is slow - towards Sty Head Tarn. The Langdale Pikes are seen in the distance. Our route onwards from the Tarn led to the left, via Sty Head Gill, past Taylorgill Force, and down to Stockley Bridge and ultimately Seathwaite, where we had tea at Stan Edmondson's farm before returning to Keswick by minibus.